Toilet paper is a household staple that we use everyday; so how can we save money on toilet paper? This is a guide about saving money on toilet paper. 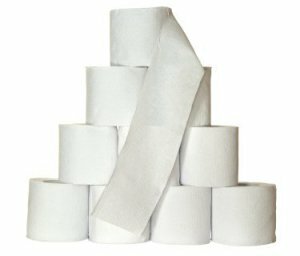 Buy your toilet paper in bulk from online restaurant overstock suppliers. You can get 96 rolls of toilet paper for .67 a roll. Most are double ply, so if you turn one roll into two rolls, you can get 192 rolls of toilet paper for under $65! I just wanted to share that I found a way to save on toilet paper. Just put a crimp in it so that it does not go round and round so easily. By having the crimp, it stops and allows you to use a smaller amount instead of the waste of what you don't really need. Toilet paper can easily go to waste, especially if you're using multiple-ply styles, and have people in the house who love to just pull and pull at the roll. We have young ones in the family who love to use our homemade indicator, which shows them where to stop pulling. I hate spending money on toilet paper it is so expensive and and uses up so many resources; It also fills up the system. At first, I was embarrassed about this tip but no more! Now I use a soft washcloth (for #1 only). I rinse it well after each use and hang on a small cup holder discreetly behind the toilet where I can reach it. I actually like this so much better than paper. It is cool and cleans well and doesn't leave lots of paper debris behind. As long as you rinse the cloth well, you can use it for a few days and then throw it in the laundry. I take the price of a bag of TP and divide it by the number of squares total in the package. (12 rolls at 200 sheets/squares per roll is 2400 sheets.) Forget the square footage - people pull off a certain number of squares out of habit. I found that even at full price, the generic 1000 sheet rolls in a 12 roll pack are the least expensive. It sells regularly for about $9. At Safeway, until Christmas, they have a sale on another brand for $6 a pack. Just take a calculator and divide it up and you'll see what is the least expensive that week. Another option if you have very young children is to take a roll and divide it into 4-5 square pieces and encourage them to use only one piece per bathroom visit. You can also flatten each roll a bit between your hands so when pulled, the roll doesn't just keep running until it's all on the floor! This is simple--no math involved. Buy Scott Toilet Tissue. Our household lends itself to many spuratic sleepovers--we have a recording studio in our home. So, I know how fast the potty paper goes. If you watch your grocery- drugstore weekly sales flyers, you will find Scott on sale for $5.99 at least once every 6 weeks for a 12-pack . And if you clip coupons, wait for the sale and save on. It might not be the plushest TP, but you will be amazed at how long a roll lasts! I find that if I flatten the roll of toilet paper so the tube is bent a bit and doesn't roll so easily my family goes through a LOT less toilet paper! Same thing works for paper towels! I was once told that putting the roll on backwards helps the problem of extra usage. I've tried it,and it does help.It's just one of those things in life (like buying feminine pads) that us frugal women hate but MUST do, and learn to live with. 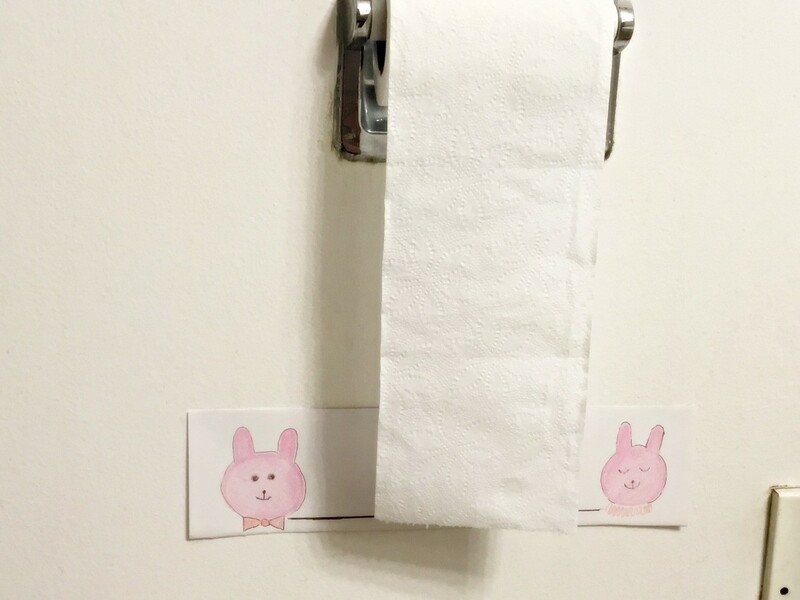 One of my friends successfully used this method to save on toilet paper in their home. They put a piece of paper with the number "4" on it where it was easily visible to the person sitting on the toilet stool. All of the members of the family knew that it was there as a reminder to economize. Guests didn't know what it meant, unless they happened to ask, which is what I did. If you mount your toilet paper dispenser so that it is approximately four sheets of paper above the floor, some members of your family, without realizing it, will limit their paper use to that many sheets at a time. 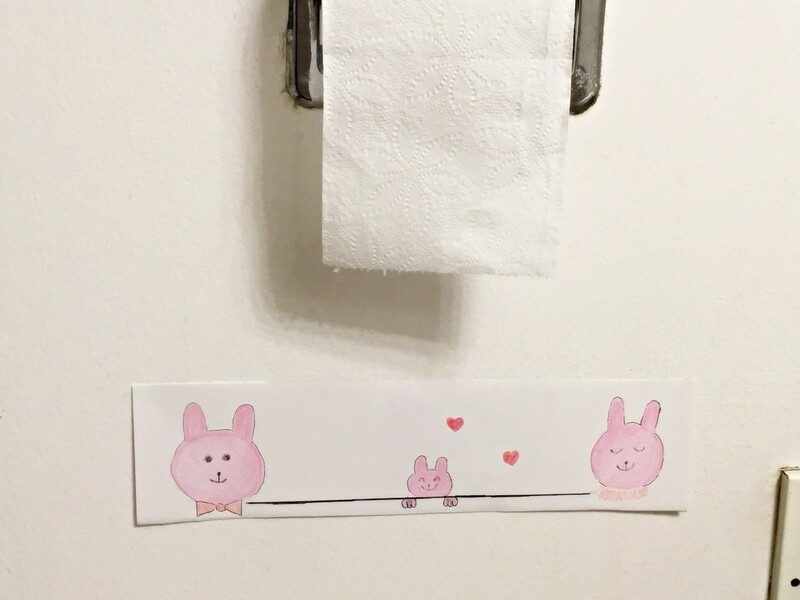 Teach your kids exactly how much toilet paper they need to use. Most of the time, kids use way too much. Go to www.charmin.com and order the free "Potty Training Kit". It comes with a toilet paper measuring thing that you hang on the roll with your toilet paper so kids can see just how much they should use. About Scott's.....The extra soft really is SOFT! I loved cottonelle (cursed with hemmroids after my second blessing) but tried it at my mom's and was impressed! You may have to surprise your family with it, it took awhile for DH to get used to it! Use double coupons. Also, there is a good quality, good value brand called BASIC. I believe it's made by the same company that makes Bounty paper towels. Don't forget to teach them to wash their hands very well after using the toilet. New mothers and others, after you change your babies, please wash your hands each and every time. You are spreading germs to anything you touch. Babies are cute but not sterile. Absolutely right but you should also teach them to wash their hands BEFORE using the toilet in a plublic place or at home. In a house the place with more germs and bacteria is not the bathroom it is the kitchen. How do you determine the best buy on toilet paper? This is driving me crazy! Usually the packages with oversize rolls will show how many regular size rolls they equal. I take the "regular size" number and divide it by 4, since 4 regular rolls would be in a small package. So if a package says, for example, that it's equivalent to 32 rolls, I divide 32 by 4 and get 8. If the large package is $8 or less then in my mind I'm getting a good deal. I have had several people tell me the best buy is the Scott 1000 sheet rolls. However, I have visited where people use it and I don't like it. I don't like the regular Scott. It is a great value, but it smears too much. If my family won't use it, not much of a buy! Sign up at various brands' websites and you can get coupons sent to your email, or regular mails. I usually get the doulbe roll Angel Soft, as it is avail most places I shop. You also have to consider the type of paper it is. A person does use less of the high quality brands, so it might be wiser to buy better quality paper rather than the cheapest. I buy the largest packages I can get when it is on sale; I buy a good quality brand as I find it is nicer, and actually I use less. It's really true that Scott 1000's are the most economical, especially when on sale. However, I've found *some* store brand 1000's that are just as good. I despise scott 1000 sheet YP. Id rayher usr mu hand or nothing. I love sams TP, its better than ANY brand name. 12 pack for $4 or $5 . I use reusable cloths for myself for #1. Saves alot. Has anyone done a study as to what 2 ply toilet paper is the most inexpensive? There have been studies. White Cloud, available at Walmart, is considered a Best Buy in quality and value. I only buy the store brand at Big Lot....when I did a by the sheet calculation almost 2 years ago when I was doing my most intensive budget pare down ever, it was the least among all the name and store brands. I check the package every now and again to make sure they aren't short sheeting it (pun intended), but it seems to have stayed the same price and quantity since I did my study. Sometimes if there are really good coupons and/or in-store rebates on a name brand at our Giant Eagle, if the per sheet cost is equal to or less than Big Lots brand and I am already there (so no extra trip), I will buy it, but that is rare. I find all of the name brands to fluffy...and they shred easily...which I hate. Most of the studies were done several years ago so they may not be the same in today's market. Consumer's Report (2016) listed White Cloud. "While the best all-around toilet paper is Walmart's White Cloud Ultra Soft & Thick, it isn't the very softest. For that, Consumer Reports recommends Walgreens' Nice Premium Ultra. It's not all that strong, but it is very soft." Remember there are several different products made by all companies so be sure you are looking at the same one that a report shows and not one of their other products. One of the latest reports shows Cottonelle - Ultra ComfortCare as the softest they also rate Quilted Northern - Ultra Plush as a close second. Why not compare some of these listed (price comparison is usually marked on price label at Walmart) and then whatever you buy keep notes on how much it cost as well as how well you like it and then decide whether to continue with that brand or move on to something else. A very big point to remember is that prices for each product varies by whatever store you use. Do your kids get mesmerized watching the toilet paper roll spin 'round and 'round, thereby using WAY more paper than they actually need? Next time, before you put the toilet paper roll on the spindle, "squoosh" it slightly between your hands. This will flatten the inner cardboard roll just enough to cause a little resistance as the roll turns -- resulting in fewer "avalanches" of TP!